A dictionary defines "Coordinates" as "each of a set of references that together describe the exact position of something with respect to a set of axes". These are spatial coordinates, which originally started as XY in 2D (the Cartesian coordinate system). They were later extended to XYZ in 3D. This website intoduces 4D in the order of time, Z, Y and X for use in health care. Plans for the global health care system require 4D mental imagery, and the order of specifying use of each dimension is important, for it affects our decisions on health care procedures and settings such as clinics and hospitals. "Time" is specified first, because the value of spatial specifications for human activities is evaluated in terms of human time. In other words, T (time) itself sets the value of everything that occupies space specially body parts in various positions. Time questions are in the order of Frequency, Duration and Timing of use ( FDT) , and conclusions on time precede conclusions on z,y,x dimensions. T and Z (vertical dimension) are both earth coordinates, in which we live. Z is the link between the earth coordinate and the human body. That is why they are specified first. Y and X coordinates are for human body; Y (antero-posterior) axis denotes body thickness, while X (right-left) axis denotes width of human body. Z, Y and X are taught worldwide as basic spatial coordinates in elementary or high schools levels. ZYX coordinates are widely used in science and engineering. ZYX most efficiently establish 3-dimension imagery in the minds of professionals. ZYX terms are short and provide the best introduction to numeric sets needed for global-local health care. ZYX and numeric terms link well to illustrations, figures and also fit well into data forms. ZYX and numeric terms enable precise communication among health professionals worldwide with no bias to a regional language. Z, Y and X are based in rectangular and polar coordinates for biological and material forms. Z-Y-X order prevails in recordings of sites and size. Z denotes toward and away from centers -includes the earth, body, body parts and objects. Y denotes thickness or diameter. 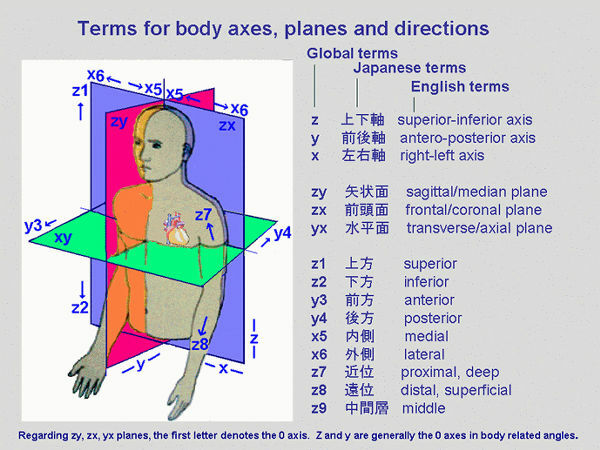 We still learn various terms from anatomy texts to express body axes, planes and directions. Such terms as height, width, length, superior, inferior, anterior, posterior, dorsal, ventral, sagittal, medial, coronal, transverse, lateral, proximal, distal, deep, supination, pronation, flexion, superficial, vestibular, buccal, lingual, occlusual, upper, lower and other terms are used to locate body parts. These specialized terms are based in regional literacy that often do not fit well into the syntax of other languages or health records. Such terms cannot be adopted in a global health care system. Z, Y, X , 1 or 2 digits and + provide terms that replace all of the above examples. Human anatomy is based on spatial relations beginning with body axes, planes and directions. Numeric order with xyz imagery best links gross anatomy with microanatomy and procedure anatomy. Anatomical parts are generally identified first in the long axis of the body (Z), next identified by thickness as in the front section or back section of the body (ZY planes) then parts of these sections are viewed in frontal or dorsal planes as medial-lateral or right-left (ZX planes). To denote a plane, the axis which serves as a reference (0) for measurements of angles or rotations are stated first. Example: When rotations or angles measured from Z axis in a plane consisting of Y and Z axes, the plane is named ZY. The selection of 0 for measurement of angles is usually in the order of ZYX. The digits for directions are assigned to efficiently link gross anatomy with ZYX based terms for detail needed in procedure anatomy. These directional digits become the second digit in 2-digit sets that denote global names for surfaces, surface aspects, lines, line segments and points of body parts identified in gross anatomy. + is the direction in which muscles can apply the most force.